The Captive is an Imperial citizen who went swimming in a pond to the northwest of the Shrine to Peryite. She went alone despite recent Forsworn sightings, and can be found dead and floating face down in the pond with some Forsworn arrows sticking out of her back. She does not have anything in her inventory. However, her clothing is found near her body; farm boots, farm clothes, and a farm hat. With the clothing is a journal that documents her poor judgement, as well as a gold ring and silver emerald necklace. There is also a satchel nearby. This has a chance of containing some or all of the following: a lockpick, gold, and a leveled potion of Restore Health, Restore Magicka, or Restore Stamina. Evidently, she placed these near the pond before she went swimming. According to her journal, she has a father, however it is unknown who this is. 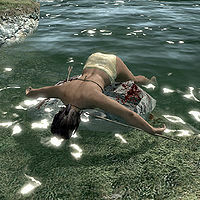 Her father warned her not to go swimming but she ignored the warning and the rumors of Forsworn around due to the fact that she liked swimming a lot. She believed that the Forsworn would not leave their tents, and refers to the pond as her "special place". This page was last modified on 17 October 2018, at 18:12.